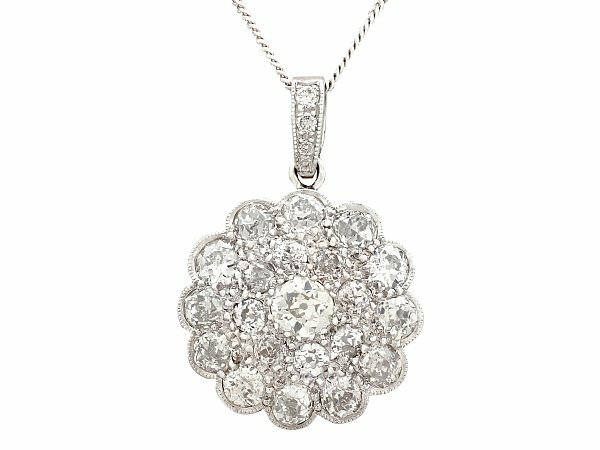 This stunning, fine and impressive antique cluster pendant has been crafted in 18ct white gold. The pierced decorated, scalloped edged cluster design is ornamented with a feature central pavé set 0.23ct Old European round cut diamond. The millegrain bordered cluster is embellished with a further twenty pavé set Old European round cut diamonds. The pendant suspends from a contemporary 18ct white gold fine link trace chain via a flared and millegrain decorated ring loop attachment to the upper border of the design, accented with a further three pavé set Old European round cut diamonds. The chain secures with a conventional spring loaded bolt ring fastening to the reverse, and may be replaced with a chain of the same quality, in a style or length to meet your personal requirements. The pendant has been independently tested using state of the art technology (Niton XL2 Analyzer) and verified as 18ct gold. This antique diamond pendant is supplied with an independent diamond grading certificate for the feature diamond in addition to an independent diamond grading report card for the supporting stones. 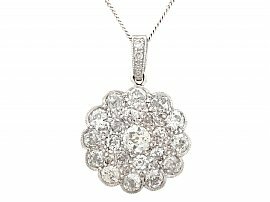 This stunning pendant is exceptional quality set with old cut diamonds. The pendant is an exceptional gauge of gold and is in excellent condition.